PENELOPEhas been extensively upgraded to modern day standards while retaining her classic profile. A thorough update of all systems from the hull up has transformedPENELOPEinto a modern and easily operated, user friendly yacht. Her exterior paint, varnish, and teak decks are in yacht condition and​PENELOPEis ready to cruise. 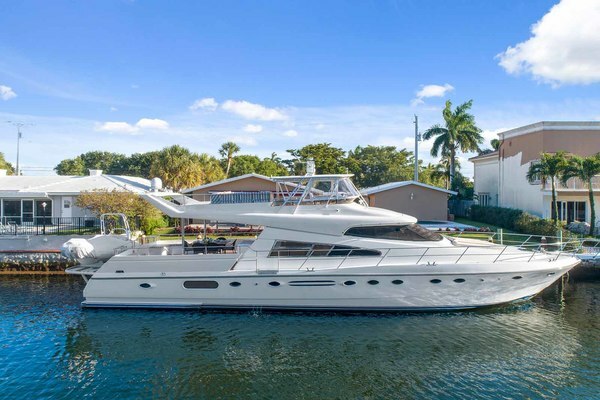 United Yacht Sales New Jersey would love to guide you through a personal showing of this 64' Burger Pilothouse Motor Yacht 1966. 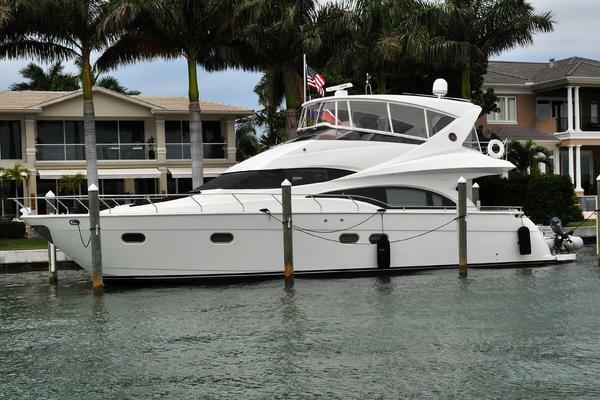 This yacht for sale is located in Baltimore, Maryland and priced at $625,000. For a showing please contact us by filling out the form on this page and we will get back to you shortly! The Master Stateroom is aft, separated from the transom by a full sized lazarette accessed from the main deck level. The woodwork in this stateroom is a lightly stained cherry. The master berth is a king sized bed running athwartship against the port side bulkhead. Flanking the berth are bedside cabinets with Corian tops and overhead reading lamps. For convenience, bookshelves have been tastefully built against the outboard bulkhead above the berth. A full width hanging closet spans the aft bulkhead and to starboard are two bureaus flanking a vanitywith drawers, lighted mirror and a swivel-mounted jump chair. Forward to starboard is the master head with corian counter and sink, stall shower, and porcelain bowl Headhunter toilet. A mirrored medicine cabinet, tastefully designed by the owner, is positioned above the sink. Forward and down 4 steps from the galley/dining level is a spacious laundry area with a built in, full sized Bosch (2015) washer and dryer. There is a large amount of storage built into an outboard cabinet system with laminated working countertops. A supplemental Avante freezer is positioned on the aft bulkhead, adjacent to the engine room access hatch to port.Opposite the laundry area to starboard is a former stateroom that was converted to a storage closet which provides an area for tools and supplies. There is a passage door that opens into the forward head with corian counter and sink, and porcelain bowl commode. Flooring is teak and holly and a mirrored medicine cabinet is above the sink. A second passage door from the head opens to the forward bunk cabin with upper and lower berths to port. The upper bunk is generous in size and could serve as a double berth. Furnishings include reading lights and overhead is an opening hatch with tinted Lexan and a screen. Opposite the berths is a hanging closet and forward is the stall shower with an opaque plexi-glass door. Forward of the shower is the watertight anchor chain compartment containing 325’ of galvanized 3/8” BBB chain. Aft from the galley and up a few steps is the air-conditioned pilothouse with port and starboard sliding doors opening to the exterior side decks. There are folding teak screen doors for the side door openings. As with the rest of the yacht, the pilothouse has been completely renewed with modern gauges, instruments, and electronics. The headliner in the pilothouse is Velcro fastened for easy removal for access to overhead wiring. The original bench seat has been re-upholstered in Ultra-leather and hinged to the port side bulkhead is a fold down teak chart table. The Captain's chair is a leather upholstered tan Stidd with blue piping and is mounted at the helm console. The console has been refit with new wood veneer and new cabinetry was built in for mounting the dual 2015 Furuno TZ2 Monitors. All new Stewart Warner engine instruments have been mounted into the original but refurbished Detroit Diesel instrument panel.Beneath the pilothouse bench seat is drawer storage for charts and navigational tools and additional storage is located to port beneath the helm console where there can also be found an electronics sub panel. The vessel’s navigational electronics are powered up by a 24V bank of house batteries in the lazarette but there is also an independent back-up bank located in the engine room. Full 360 degree visibility is afforded to the helmsman by virtue of the forward, side, and aft windows in the pilothouse. Off center to starboard is the teak passage door to the aft deck salon. A windowed insert in this door folds down revealing a screen and there is also an opening window behind the pilothouse bench seat for communication with the aft deck. Next aft from the pilothouse is the teak decked aft salon which has a teak topped bar with refrigerator built-in along its forward bulkhead. In 2015, the bar was modified to include a 50" retractable flat screen HDTV. To starboard, there is a built in liquor cabinet constructed of teak. The aft salon is furnished with an expandable height-adjustable round table and chairs for aft deck dining or cocktail service. Teak framed wing doors are forward to port and starboard opening to the side decks. Custom Sunbrella drapes were added in 2016 on 3 sides of the aft salon for privacy. There are two sets of side windows port and starboard and in 2015 a permanent teak bulkhead with glass windows was installed aft to provide a full enclosure of the aft salon. There is a sliding teak windowed door in the bulkhead to access the aft deck which provides about 3' of outdoor deck across the beam for easy line handlingand access to the swim platform. PENELOPEwas refit in its entirety in 2001 and a new main distribution panel was relocated in an existing closet recess to starboard opposite the main salon galley, adjacent to the steps to the pilothouse for easy access. Sub-panels are positioned in the engine room and to port of the helm in the pilothouse. The vessel operates primarily off the 220V AC and 24V DC systems with most equipment wired to run on these voltages for better efficiency and longer life. Transformers are employed to accommodate equipment requiring 12V or 110V power.Battery banks consist of three banks of 24V gel cell batteries in the lazarette, one for each main engine and a house bank of batteries. In the engine room there are independent 12V gel cell batteries for each generator and a third 24V bank which serves as a back-up bank for navigational electronics.Two 50 amp shore power cords, approximately 100’ in length, are deployed by the two Glendinning shore cable reel systems with access from beneath the port bench seating on the foredeck. Additionally there is a phone and cable TV connection located at this point. In the engine room are two20Kw Kilopak gensets, new in 2001 including Kilopak sound shields. Additional sound control is achieved with the use of a customized exhaust system for the generators.The vessel is protected from stray current and voltage spikes in the shore power supply with the use of isolation transformers and voltage booster regulators and a Kapac hull corrosion monitor. Engine room lighting is exemplary, featuring 11 florescent 110V double light fixtures along with a 24V emergency lighting system. The engine room was stripped down to bare hull in 2001 to make way for a fully redesigned and updated layout. The bilges were closely inspected, suspect metal replaced, and the entire bilge area painted with Awlgrip Matterhorn White. Insulation is built into the overhead panels and outboard. New exhaust tubes were installed from engine room to transom. Shaft tubes were inspected and forward flanges rebuilt. The shaft stuffing boxes updated with Dripless Tides Marine Strong Seals. All bearings, thrust bearings and shaft seals were replaced in 2015 A large tool box is built in forward and a workbenchwith vise is fixed atop the work bench. The fresh water system is unique in that it has a manifold transfer system enabling movement of water to or from any of the tanks, similar to the fuel system. The engine room is extremely well lighted and access to all equipment is convenient. PENELOPEhas undergone several yard periods to keep her systems updated and hull in top condition. Below is an outline of the more significant works that were completed. Supporting documentation with photos is available upon request.Refit in 2001 included: Repowered with new engines and generators, all wiring replaced, all pumps, fresh and waste water systems, raw water intake systems, shaft tube flanges were replaced; sand blasting of the bottom and new barrier coat applied; rebuilt water tank and baffle system; new gaskets in pilothouse windows; complete repainting. At the same time, a major interior redesign was completed which moved the original, lower level galley up to the yacht’s mid-level creating a country kitchen with a large dinette adjacent. The interior is finished in beautiful satin toned maple woodwork throughout with granite countertops in the galley and Corian in the heads. Teak and holly sole is found in the galley and pilothouse as well as the heads.2008 Refit: Hull faired primed and painted. All paint was removed down to the original fairing or bare aluminum. Awlfair was applied and sanded smooth. Four coats of High Build primer applied and three coats of Awlgrip "Oyster White" sprayed. All exterior teak decking was replaced and new Austin Power sub-decking was installed. Aluminum stanchions replaced with stainless steel. Windshield wipers replaced. Spotlight replated and rebuilt.2015 Refit was performed by Thunderbolt Marine in Savannah, GA. Works included re-plating areas of pitting in the engine room; port, starboard and main fuel tanks. Re-plating and repair of pitting in forward water tank. Repaired pitting in aft water tank.Repair pitting in black water tank. Main and aft fuel tanks cleaned. Replaced rudder bearings. Propellers tuned. Head gaskets of both engines replaced. New engine room battery charger. New washer and dryer installed. New dishwasher installed. Replaced air compressor. New shore power cords. Both AC pumps rebuilt. New window seals in pilothouse, galley and aft staterooms. Converted forward stateroom to storage closet. Remodeled main salon and installed permanent teak bulkhead. Modified buffet to accommodateretractable HD TV. New refrigeratorinstalled in buffet on main salon. New headliner in main salon.2018 -PENELOPEwas hauled out at Thunderbolt Marine in Savannah, GA to undergo its last refit in preparationfor her sale. Major items completed during this yard period included new hydraulic control box, any and all blisters observed repaired and re-sprayed. All exterior brightwork taken down to bare wood and built up with 15 coats of finish. AC overboard manifold replaced with stainless. New pilothouse AC cables run.PENELOPEis in excellent condition for her age and is ready to cruise with her next owners immediately. Ship's Bell and barometer in pilot house.Pentax and Steiner BinocularsNespresso coffee makerSmall table on Starboard side of salon next to corner chair.HP Printer stored in cabinet at forward end of salonCocktail glasses and bar utensils located in cabinet on stbd side of salon.Personal clothing and provisions. In most respects, looking beyond her original proven hull and vintage profile,PENELOPEis a 10 year old yacht. Refits in 2001, 2008 and 2015 were undertaken which improved both layout and systems.Safety, efficiency, comfort and aesthetics were all important in the process and the results of this project have been overwhelmingly successful.PENELOPEis an outstanding yacht which will be vastly appreciated by her next owners.PENELOPEcan sleep 4 in two double staterooms aft and an additional 3 in double cabin forward which is currently being utilized as the Captain's cabin.Throughout the vessel’s interior there is updated woodwork, flooring, granite countertops, and headliner with recessed Xenon/Halogen Staluppi lighting. The yacht’s interior woodwork is teak, cherry, maple and birdseye maple utilizing solid timbers, raised panel cabinetry, and fine veneer work. Flooring treatments consist of custom wool carpet, and teak and holly sole throughout. Fabrics are generally a combination of fine woven blends and Ultra-leather to compliment the woodwork. The yacht is beautifully appointed and extremely comfortable throughout.